This is the essential Music Together® class, one that a child can attend from birth through age four through all nine song collections. This basic class follows the recommendations of child development researchers—grouping children of a variety of ages because this fosters natural, family-style learning. Younger children enjoy watching and imitating older ones; older children learn by leading younger ones; and adults are happy because the children in the family can go to class together. Each child participates at his or her own level in singing, moving, chanting, listening, watching, or exploring musical instruments. Any caregivers—parents, grandparents, nanny—can bring the children. The whole family is welcome for this important family music experience. Every child’s development benefits from early exposure to music and movement. Because the early months are so important, Music Together offers two options for babies. Babies eight months and younger at the time of registration may attend a Mixed Ages Class, whether registered on their own or attending free with an older brother or sister. 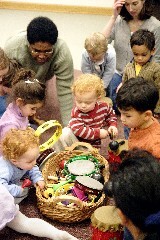 Babies may also take the special “Babies Class” offered as a one-semester introduction to Music Together. (This class cannot be repeated.) The music activities and materials are specially designed for parents who want to learn as much as possible about music development in babies. Meet other parents of newborns and learn some fascinating music activities you can recreate at home with your baby. 5-, 6-, and 7-year-olds. The program blends the elements of Music Together that parents and children love with new activities, skills, and challenges that are developmentally appropriate for this age group. Big Kids classes lay the foundation for Basic Music Literacy, complementing music instruction in school or instrument lessons, and leading to a lifetime of joyful music-making. The curriculum includes solfège, solos and ensembles, folk dances, harmony singing, vocal development, and drumming. In a safe, fun environment, your child can experiment with new activities like conducting and improvisation, story songs, and game songs. Parent attendance is welcome but not required. Each family receives a Big Kids songbook, CD, solfège cards, and HomePlay activities, so that the entire family can continue the fun and learning at home and parents can stay connected with what the child is learning in class. Sing, dance and build technique and musicianship in an organic, relaxed way while learning new ways to explore Music Together songs with their child at home and on the road. And, it’s an enjoyable night out with other parents of small children. Classes run for 8 weeks. Participants receive a workbook and bring their own guitar, capo, and tuner. If you would like to learn to play guitar using Music Together songs as the vehicle, this is the class for you! Weekly Music Together Preschool classes are 30- to 45-minutes long and include an artistically conceived flow of songs, nursery rhymes, instrumental jam sessions, fingerplays, and movement activities. The combination and types of activities are research-based and support children’s developing competence in tonality and rhythm. In addition, activities evolve from the child’s world and include vocal play, animal sounds, rhythm play, language play, and a good bit of genuine, silly fun. Classes are taught by a registered Music Together teacher who is trained in music development and skilled in leading participatory music activity. Children “bring the music home” to their parents through the family CD and songbook.